Service and Dress Uniform . The outdoor uniform for Navy Nurses described below was first proposed during the summer of 1941 and authorized in March 1942. It should be used by personnel who served overseas or had to work under cold weather conditions. In the beginning, the nurses had to buy this uniform at their own expense. In September 1942, the first nurses who were assigned to the South Pacific area received the new outdoor uniform. In November 1942 the wear of the street uniform became mandatory.
. 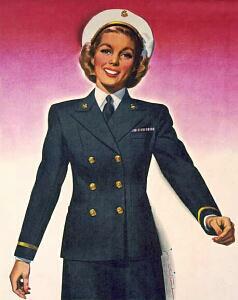 The blue service uniform for Navy Nurses was a feminine version of the male Navy officer's uniform. It consisted of a double breasted navy blue jacket with matching A-lined skirt. The uniform was made in summer weight and winter weight material. .. The jacket had 6 gold buttons of Regulation Officer’s design on the front. Gold sleeve braids designated the relative rank. Since the Navy Nurses had not received full naval commissioned ranks yet, they did not wear their corps insignia above the sleeve braids like the men did. Instead, the gold NNC corps device was placed vertically on the collar, ½ inch from each edge, with the stem of the oak leaf pointed inwards. The jacket had a small breast pocket on the left front and two side pockets above the hips. The uniform was worn with a white shirt, black tie, black stockings and black oxford style shoes. Grey gloves or white gloves for dress wear were optional. A navy blue cap was worn during the winter months. A white cap was worn during the spring and summer months according to the unit commander and climate at the base location. ( Revised 1944 Model) . The revised uniform regulations in August 1944 authorized the wear of the new NNC device (oak leave with silver acorn superimposed on an anchor) above the golden sleeve braids of the blue service uniform. It replaced the former metal NNC device worn on the collar. Blue service uniform worn with the new authorized NNC cap with Navy officer's cap device. The dark cover was worn during the winter months. A pair of gray gloves (replaced by black gloves in early 1945) were optional (white gloves for dress occasions). In December 1944, beige hose replaced the black stockings previously worn with the navy blue service uniform. ........ .
During the spring/summer time, the navy blue service uniform was worn with the white hat cover and white gloves (optional). Instead of oxford style shoes, black pumps of plain design were allowed to be worn with the blue uniform as well. The two golden sleeve braids on the uniform shown in the pictures indicate the rank of lieutenant. Blue Outdoor Uniform - Postwar . In 1948, the Women's Armed Services Integration Act incorporated all Navy women's branches into the regular Navy. As a consequence, all uniforms worn by the female personnel (no matter if they were Navy Nurses or WAVES) were standardized. The popular style of the WAVES uniform with its rounded upper collar, which already had been adopted by the Coast Guard SPARS during wartime, was chosen. The uniforms for officers were darker in color than the uniforms for enlisted personnel. The sleeve stripes designating the rank were golden. Members of the Navy Nurse Corps wore a newly introduced NNC insignia consisting of a single spread oak leaf on their cuffs. (First Pattern) .. The white outdoor uniform consisted of a single-breasted jacket with matching A-line skirt. The jacket was closed with three golden Navy buttons. It had four pockets - two patch style breast pockets and two bellow type side pockets. A waistband was integral. Details of Bellow Type Side Pocket . With the summer uniform the relative rank was worn on shoulderboards instead of the lower sleeves. Another difference from the navy blue outdoor uniform was the absence of collar insignia on the white tunic. Instead, insignia were worn on the collar of the white shirt. A miniature pin-on rank was fastened on the right side and a miniature NNC collar. 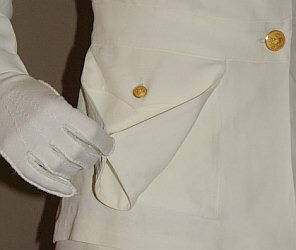 The service dress white was worn with the white service cap. A black Navy Nurse regulation cordé could be carried. A black tie, white oxford style shoes, white stockings and white gloves completed the outfit. device was fastened on the left side of the collar. In May 1944, the pattern of the service dress white was revised. The bellows type side pockets were replaced by patch style pockets. The shoulderboards with the new embroidered NNC insignia and the service cap with the Navy officer's cap insignia were worn. Additionally in August 1944, the white stockings were replaced by beige stockings. Plain white pumps or oxford style shoes were permitted. 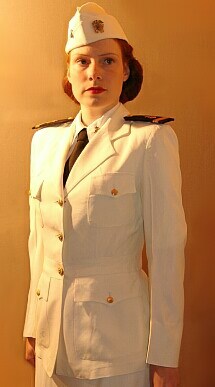 The service dress white was worn at official and social occasions where formal or semiformal summer civilian dress would have been appropriate. .
Navy Nurse Uniform, Ensign . The overcoat for Navy Nurses was introduced in 1942. 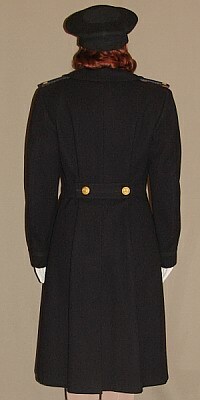 The double breasted coat with two side pockets was equipped with 6 gilt Navy buttons on the front. Black sleeve braids and shoulder boards indicated the rank of the wearer. The overcoat could be worn with a white scarf.
. In 1944, when the Navy Nurse Corps received military ranks, shoulder boards with the new embroidered Navy Nurse Corps insignia were worn. The raincoat for Navy Nurses was introduced in 1942 as optional item. The double-breasted coat was made of waterproof navy blue fabric. It was equipped with eight plain plastic buttons on the front, two side pockets and was belted at the waist. The coat had no shoulder loops nor sleeve braids.